The Yamaha RX-V3067 is a deceptively polite flag-bearer for Yamaha's latest generation of AVRs. It sits at the top of the brand's 3D-capable range, but it's an unassuming hero and certainly doesn't cast the same shadow as its Z11 and Z7 forebears. This upper-midrange, 7-channel AVR is literally a bit of a lightweight (17kg), albeit one with trappings of sophistication. Build quality, however, is on the right side of prestige, extending as far as its satisfyingly metallic remote. Rear-side connections are generous, featuring seven HDMI inputs, plus another on the front, and two HDMI outputs that enable you to route to a flatscreen TV and a projector. It's possible to set the AVR to feed both simultaneously, or you can manually select either one. All the HDMI connections are v1.4, which means there's compatibility with 3D (we successfully tested the unit with Sony's 3D VPL-VW90ES projector) and ARC (Audio Return Channel). The latter enables audio (from a v1.4 TV) to travel back down the cable to the receiver; this saves having to use a digital audio output on the back of the screen if you want to get audio from the TV's tuner through your sound system. There's also provision for iPod connection via the Universal dock and Bluetooth streaming. While the RX-V3097 supports all the principal surround sound codecs (Dolby Digital Plus, Dolby TrueHD, DTS-HD High Resolution and DTS-HD Master Audio), there is no provision for Dolby Pro-Logic 11z or Audyssey DSX height/width processing. Instead, the brand offers its own height/presence channels for the front and rear soundstage, provided you're prepared to add an external amp to power them. For this audition, we chose not to add additional amplification and so ran the receiver in a conventional 7.1 configuration. The V3067 offers connection for two subs, using designated front and rear outputs. Also missing from the post processing feature roster is THX. Yamaha has being playing fast and loose with THX, only buying in the licence for its highest-end receivers. 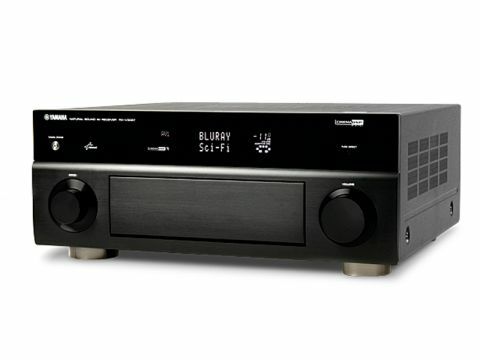 It dropped widespread certification in 2006, only to reinstate it for the RX-Z11 a year later, when it became the first AV receiver in the world to feature THX Ultra2 Plus certification. THX is off the menu again for this model and, frankly, it is missed. By way of compensation, there's the latest selection of the brand's long standing Cinema DSP modes, but, to my ears, none of them offers the seamless and balanced movie presentation of THX Cinema. Room calibration comes via YPAO, Yamaha's proprietary measurement suite. The AVR ships with a small mic and weird plastic Frisbee. The latter is used for measuring the angle (rather than position) of the speakers and is an optional refinement. It's easy to appreciate the construction values employed here. Extra rigidity comes from the AVR's double-bottom construction, and there's a big new heat sync and symmetrical power amplifier layout to manage heat and power. Beneath the bonnet are Burr-Brown PCM1796 DACs, while video processing comes courtesy of Silicon Optix's VHD1900 HQV chipset. This offers a surprisingly high level of picture calibration, including auto noise reduction (mosquito, block and temporal noise), variable detail and edge enhancement, plus contrast boost. I spun up the DVD release of the Angelina Jolie thriller Salt, which is a rather dreary looking disc. But, by nudging the contrast and coaxing some subtle texture out with the resolution tool, the RX-V3067 made it look a good deal more respectable on a large display. Six memories are available to store custom tweaks. Also provided is an FM/AM tuner, although given that there's integrated internet radio support, it's hard to believe anyone would use it. Yamaha seems rather pleased with its new user interface, but I don't share its enthusiasm. Learning to drive the RX-V3067 is rather like taking a course in ancient Egyptian hieroglyphics. The brand has gone its own way when it comes to this UI, eschewing straightforward lists and instructions for a predominantly graphical approach. Selecting On Screen from the remote calls up a vertical bar, which offers access to Setup, Input and other niceties. Choose one of these, and a second bar pops up across the bottom of the screen, sporting more graphics. Click here and another pop-up appears in the centre of the screen. The brand also expects users to invest a significant amount of time in its so-called Scene presets. There are four dedicated buttons on the remote (for Blu-ray, TV, CD and Radio), from a total of 12, all of which can be edited as required. For me though, this is just more obfuscation masquerading as ease of use. Graphical WTF is taken to an extreme when it comes to assigning inputs. Rather than just scroll and select text options, you have to decode a graphic that resembles something from a PC puzzle game of the 1980s. Any GUI which forces you to cross reference with a manual constitutes a Fail in my book. More Scooby Doo mystery is encountered when you want to update the firmware. The process involves all manner of arcane button presses via the AVR's Advanced Setup routine. Why it can't be in the regular setup menu is beyond me. Does Yamaha think we'll not be able to resist the siren call of firmware updating and bugger things up? For all its unnecessary graphics, the RX-V3067 does at least know how to kick back and party. Ultimately, this is an AVR with a musical heart, at its happiest with riffing rock 'n' roll. Keri Kelli and Damon Johnson's infectious axe work on the live version of Poison (Alice Cooper's Theatre of Death, Blu-ray) provokes involuntary air guitar. Alice's ragged yet distinctive vocals are locked centrestage, while harmonies as flat as week old Bud, drift in from the left. It's just like listening from the mosh pit of the Hammersmith Apollo. Adding Yamaha's own Music Video DSP to the original DTS-HD MA mix of the disc genuinely enhances the ambiance. When the audience sings along to 'I love the dead', it's as if the room is filled with phantom carolers. If you're looking for an AVR able to integrate with your networked music collection, then this one is a peach; integration of media playback is extremely well thought out. The AVR may be DLNA compliant for music only, but it will scour your network for MP3, WAV, WMA, AAC or FLAC 96/24 files. It can also read the same from local USB flash drives. A FLAC rip of Serj Tankian's Elect the Dead Symphony was meticulously rendered, the clean vocals being held away from the sweeping orchestral backing, rather than blended in with it. To make the most of low-bitrate MP3s, Yamaha has a Compressed Music Enhancer, which rather cleverly plumps out their frequency response. The benefit is subtle, but definitely advantageous. In addition to wide ranging audio support, the display will also present any album art it finds in the requisite folders. The execution is seamless. Priced at £1,500, this Yamaha finds itself surrounded by AV piranhas in the shape of Pioneer's highly-rated THX Ultra 2 SC-LX83 (similarly ticketed) and Onkyo's THX Select 2 TX-NR808 (substantially cheaper). Both are market leaders for good reason. In its defence, the RX-V3067 has a melodious character and integrates streaming music extremely well. Those seeking a well-made, multimedia music hub should shortlist it without hesitation. It's unfortunate that the brand's new GUI does nothing to make this advanced amplifier easier to drive. Consequently, buyers are advised to audition before committing.